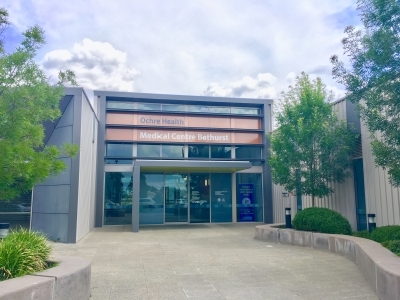 Ochre Health Medical Centre Bathurst is located in a purpose built building on the grounds of Charles Sturt University, close to the world famous Mount Panorama Motor Racing Circuit. The spacious premises have ample on-site parking. Mixed Billing – Pensioners, Healthcare card holders, CSU Students, Children under 16 years will be bulked billed. Open and flexible contract arrangements – None of our doctors have fixed terms in their contracts. They choose to stay with Ochre Health because they want to and share our passion for improving health outcomes. A commitment to education and training – Our doctors are supported in pursuing their own professional development and we are committed to providing centres of excellence for GP Registrars and medical students keen to start their careers. Full clinical autonomy – We believe our doctors should be allowed to practice their way. We provide the best software systems and operational support, that allows them to be the GP they always wanted to be. Nursing and Admin Support – We employ highly experienced nurses who assist our doctors with a wide range of medical tasks (Pap smears, CDM, care plans, …). Additionally, our dedicated Support Centre takes care of all other core business services, such as marketing, hiring, training and payroll. Mixed Billings – Our doctors have the ability to bill patients as they see fit, this is to allow them to truly focus on patient care. $300K – 345K P.A. Moratorium reduction and generous rural retention grants Eligible location for RVTS, RLRP and ACRRM Independent Pathway.